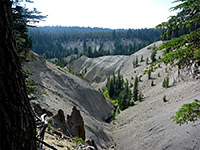 Godfrey Glen is a flat area at the lower end of the valley of Munson Creek, a tributary of the larger Annie Creek, which parallels the road to the south entrance of Crater Lake National Park, running through a deep, V-shaped ravine bordered by light-colored volcanic rocks. 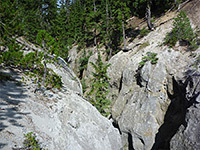 The Godfrey Glen Trail loops around a wooded promontory between the two creeks; the first stretch affords good views of the narrow Munson drainage, lined for several hundred feet by a straight wall of scoria, partly eroded into columns; similar to the more well-known Pinnacles to the east. The latter stages of the trail wind around a tributary of Goodbye Creek (which meets Annie Creek just downstream), also cutting through volcanic rocks, here rather softer but equally lacking in vegetation. 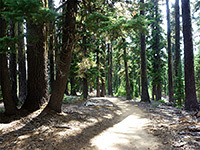 Although short, the path has a good variety of views and so is quite popular, one of two routes close to the southern national park entrance station at Mazama Village. The Godfrey Glen Trail starts from a sizeable pullout along the highway, shielded from the road by a belt of trees. A trail guide is available and the route is described as wheelchair-accessible, being level overall, though it does have a few sandy sections and some gentle inclines. Clockwise is the recommended direction; the path starts by crossing a minor drainage, usually dry, and proceeds through tall hemlock/red fir woodland with limited groundcover, soon coming close to the flowing stream of Munson Creek. 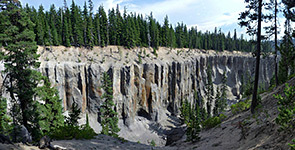 This quickly deepens, dropping about 200 feet over a short distance in a brief enclosed, vertical-walled section (Duwee Falls, which are completely hidden from the trail), followed by a slightly wider stretch, lined on the far side by the volcanic cliffs. These are partly eroded into columns and pinnacles, subtly colored in a range of shades of grey and orange. The parallel, vertical formations are complemented by the regular array of trees just above, separated by a thin intermediate layer of ash. 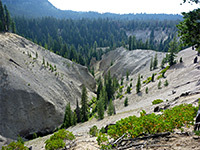 The cliffs may be seen from several viewpoints along the rim before the path bends northwards, crossing a flat ridge between Munson Creek and the adjacent drainage, a tributary of Goodbye Creek to the west. This has less steep sides, composed of soft, grey brown ash and pumice. A stream emerges about half way along the deep part of the valley, far below the path, which crosses the very upper end of the ravine by a little bridge then returns to the trailhead, the last section running close to the same creek bed encountered at the start. The surroundings here are rather moister than along the first portion of the path, so the undergrowth includes a better selection of wildflowers. In the dryer areas the only widespread species is moneses uniflora.